This PDF 1.5 document has been generated by Microsoft® Word 2013, and has been sent on pdf-archive.com on 17/06/2015 at 06:28, from IP address 24.22.x.x. The current document download page has been viewed 1114 times. File size: 1.6 MB (71 pages). DATES OF OCCURRENCES: Mark Lindquist’s Tenure - November 2010 to the present date. are timely disclosed. DPAs do not know who is a “Brady” witness. when the disclosures are provided to defense counsel. law. See attached table of authorities. PCPAO leadership disseminated a list of the declarants to DPAs. declarants be ignored and not spoken to. declarations to make it clear which defense attorneys filed them. no differently than any other lawyers involved in local cases. from the minority bar association. management sent out office-wide reminders to vote. others had to be forwarded to administration for review prior to charging. List, even though select officers were identified as “Brady” officers. resources to prepare and disseminate briefing favorable to him. ii. Authority Violated: RCW 40.14.060; 40.16.010; 40.16.020.
that the criminal case is the immediate priority. The culture of the Prosecutor's Office is one of fear and bullying behavior. encourages DPAs to occupy positions to advance his political interests. Rover. She explained to DPA Merrival that she was afraid of Lindquist. as a prosecuting attorney. Lindquist spends time on his literary career at work. on their whiteboard a checklist of who had voted. a. Exorbitant external and internal defense expenditures protecting self-interests. own support staff person assigned to them. deputies than with previous administrations. crimes alleged and prosecute on the basis of evidence of those crimes. some concluded that it was a racially motivated waste of tax payer’s dollars. a. Reassignments used as punishment. and further chose to professionally associate with declarants. prosecution and further questioned the ethics of the office. Leech - reassigned when he did not support Lindquist for election. “Brady” List - Lindquist labels Ames a “Brady” cop, but not Heishman. Farina, limiting her access to DPA support, and limiting case filings. and the office does not reflect the diversity of the community. inappropriate and culturally insensitive remarks are tolerated. payments to tribal members because they just use them to buy guns. stick together, those who do so will succeed. appeared before the Council when she supported the Minority Bar. Using DPA James Curtis to prosecute a predominately black caseload. favorable campaign poster: “Mark Lindquist - Keep Our Prosecutor”. • Making it clear to the older DPAs that they have no future in the office. young staff instead of the most highly qualified. gathers information from members to influence the collective decision making. knows he spoke against Lindquist’s wishes in a Guild meeting. Lindquist similarly monitors voting in the Sheriff’s Guild. staff’s hours were reduced and then an administrative position was created for John Sheeran. have nothing to do with merit or ability. positive perseverance and tenacity in awarding me the Bertha Snell Achievement Award. attorneys than some of the entire staffs of several other state county prosecuting attorney offices. issues. I sought election to Pierce County Superior Court and Washington State Supreme Court. prosecutors against a former detective. Four little words, yet they carry enough cargo to fill a legal freight train. bottled and sold as lawyer bait. — all players in a vast courtroom drama. tagging Ames with $118,000 in attorney fees for trying to clear his name. certain aspects of their criminal justice system is being run,” he said in a written statement. Ames’ credibility, whether he likes it or not. Is Ames a malcontent, a lying deputy, a disgruntled employee with an ax to grind? She spent the next eight months in jail. waited seven months — until June 1, 2011 — before prosecutors provided a copy of the photo. from a known series. He named it. known series that didn’t depict his client or her child. Ames replied 90 minutes later, in a crucial email that contained the four words. no good. It was a gift-wrapped present for the defense. Ames’ email with Dalsing’s defense attorney. Except Kooiman didn’t. Clower never saw the email. jail and continue the investigation. 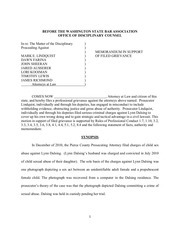 client’s release and dismissal of the charges. the woman in the photo, according to a transcript of the hearing. said investigators were still going through thousands of photos. — “we can’t see her” — did not surface. got a call from Mell. it would light a media firestorm. teacher watched and occasionally participated. Students filmed the incident on their phones. able to connect and deliver video records of the incident. summary and forwarded the report to another detective. outlets got interested. Emails flooded the sheriff’s office, demanding action. Lindquist issued a statement saying the prosecutor’s office was looking into the case. Pastor and Undersheriff Eileen Bisson. Bisson replied quickly via email. Bomkamp, raised it again on Sept. 25, 2012, referring to the link between Ames and Mell. “It smells,” Bomkamp said in an email. 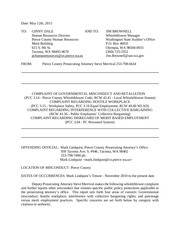 county email account to see if it included prior contacts with Mell. The search, classified as high priority, took place Oct. 1, without Ames’ knowledge. The email search found no correspondence between Ames and Mell, records state. Lindquist, informing him of the results. “Please don’t forward this,” Adamson wrote. and Adamson had mentioned the Ames-Mell connection to Lindquist in an earlier conversation. Kopachuck incident. There would be no criminal charges against the teacher seen on the video. lawsuit if criminal charges were filed. that the results were shared with Lindquist. recommendations from Ausserer and other prosecutors. While the lawsuits dragged on, Ames continued with his regular duties as a forensics examiner. 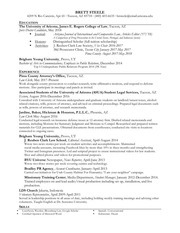 That included testifying as an expert witness in unrelated criminal cases. information regarding the credibility of witnesses. The Brady label stems from a famous 1963 U.S. Supreme Court decision called Brady v.
following an internal law enforcement investigation. label Ames a Brady cop. declaration from Richmond, which challenged Ames’ version of events. matter of making sure defense attorneys can’t accuse prosecutors of hiding evidence. defense attorneys asked for it. name-clearing hearing to argue for his reputation. Ames and Mell lost. They appealed to the state Supreme Court. incurred by Patterson and Talmadge. frivolous claim. For that, he should pay. alone carried a possible sentence of life in prison. deputy — the total exceeded $118,000. for reconsideration of the fee ruling. The case was already unusual. The next step made it more so. Richmond, the deputy prosecutor who had clashed with Ames, also filed a declaration. emails…”) that became part of the basis for labeling Ames as a Brady cop. crucial emails and the four words — just not on the exact day of their meeting on Oct. 16, 2012.
treated no differently than any other lawyers involved in local cases. disseminate the declarations. The idea was open communication. Lawyers who filed declarations on Ames’ behalf also received letters from Lindquist’s office. information. Some attorneys interviewed by The News Tribune saw the letters as veiled threats. Lindquist said his office had no motive beyond transparency. Ct. 127, 99 L. Ed. prosecutor Mark Lindquist’s office, according to public records obtained by The News Tribune. compiled by the county’s risk management division, and the costs continue to mount. seeking a hearing to clear his name, has triggered $248,334 in outside attorney fees. and legal fees from retired deputy Mike Ames. This file has been shared by a user of PDF Archive. Document ID: 00272249.